While we love our print magazines, many folks are reporting they read more of a magazine’s content when they read it on their iPad. A popular solution for reading magazines on the iPad is Zinio. For a more advanced iPad magazine offering, we turn to the Wired app. With Wired and Wired UK, we get a different look at our magazines, swipe across to see the top level pages, then up/down to read the content of the article. There is video, moving graphics and charts, and sound bits. The same technology is now being used for the Fast Company magazine. The app is free to load, even a demo magazine, then you can buy a single or yearly subscription. 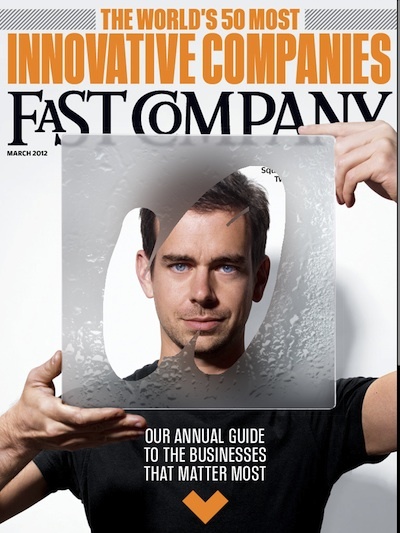 Recognize the cover of the current month’s Fast Company? The print and iPad versions carry the same content but the iPad version has the extras. Some of these extras do require Internet access to view. Navigation through a copy of Fast Company Magazine on the iPad has all the features found with the Wired Magazines. 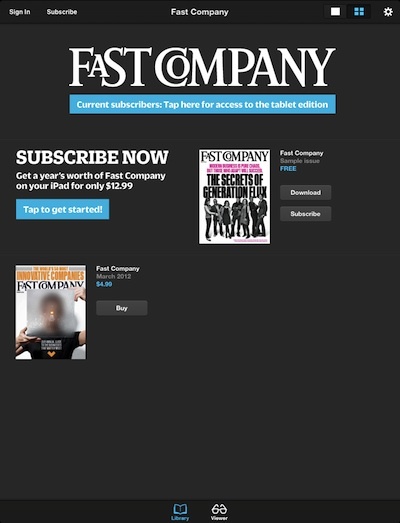 The Fast Company magazines have a table of contents, links within the magazine articles and a slider across the bottom making it easier to jump around. Flipping through the content with a finger on the very manageable iPad means less to carry. 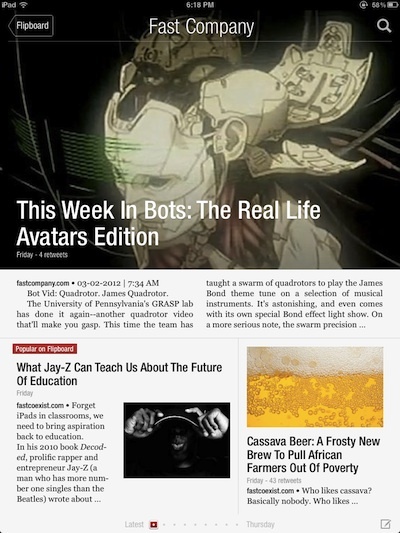 Another option to view the latest from Fast Company is the Flipboard app. Just choose the magazine provider as a content provider from within the free app and see what the latest news is coming from the same company that does the actual magazine.